You know phở, right? The staple Vietnamese noodle soup with that savory, distinct, spice-infused flavor. It’s the perfect comfort food for a rainy day (or any day, really). And for me, the broth is what makes or breaks the soup. Good phở broth goes through a long process to develop its amazing flavor. The same can be said of good design. For phở-nomenal results, there are many factors to consider. Phở has such a complex flavor. Key items like beef bones, star-anise, cinnamon, fish sauce, and rock sugar give phở its dimension and depth. But what if you don’t have access to an Asian market? You may have to forego some ingredients or make substitutions. Omit too many key ingredients, and you lose the characteristics that make phở, phở. You’ll just have some random old soup. On the other hand, sometimes you have the luxury of access to really fresh, high quality ingredients. When you get an opportunity like that, take it, and relish it. For example, if the client wants to redo their photography or asks you to redesign their logo, great! As their designer, don’t be hesitant to proactively suggest these things if they would lead to a significantly more harmonious design, but the client perhaps hadn’t thought to ask. In your design project think, what are the ingredients you can’t do without? Do you have quality copy? Imagery? A brand styleguide? What budget do you have? What existing ingredients do you have to work with and how can you use them to their best potential? Which ingredients do you still need? Due to its many layers, Phở requires a lot of preparation — from the broth to the bowls (noodles and beef) and toppings. This is where mise en place helps you be prepared to work efficiently and smoothly. Mise en place means having everything in place, or setting up. You could go in blind and just design aimlessly, haphazardly running into problems and hiccups along the way. Or, you could prepare yourself thoroughly; conduct a client consultation and do the proper research. Clients need to provide you with all the necessary insight about their company, goals, and objectives so that the design decisions are informed and the project moves forward in the right direction. Also, the client and you should create a timeline with realistic milestones. Having the final picture in mind (overarching goals to the actual deliverables and scope), and knowing the steps to get there will help you carry out the project in an organized manner. 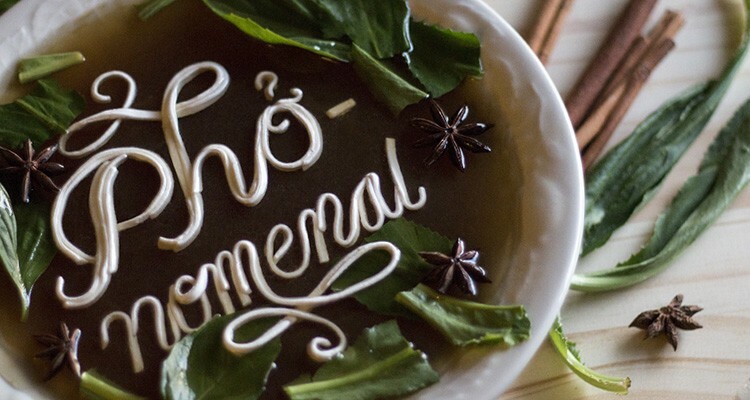 Good phở requires time, and so does good design. We start with raw ideas and components. You gather your research and thoughts and brainstorm, then you let things marinate. Ideas need to simmer long enough to break down the fibers, release the flavors, and meld into something more cohesive. Time and the application of heat makes that chemistry happen. So, give yourself enough time to design. And that doesn’t just mean the time you spend working. You also need time away from the project. A night or even a weekend between work allows you to rest your brain, and take a fresh look at the project the next morning, opening possibilities for new connections and ideas. Another important thing you should do to catalyze this chemistry is to have discussions with your design team. Don’t be afraid to ask for feedback from your peers. They can help you evaluate your design, see it from a different perspective, and give you ideas on how to push your design to new levels. Don’t forget to taste the food. In the design sense, you and the client should take a “taste check” at every step. Are the flavors balanced? Is it tasting good so far? Are you on track with the client’s goals? And if not, you have the chance to make refinements or adjust. When you check in on your “cooking”, you may notice details that need attention, which helps you prevent potential fires or mistakes. Make sure the client is involved in key decisions and approves your design recommendations. Also, make sure to allot for a sufficient amount of design rounds and/or design directions. A little special effort here and there makes the dish. In the design sense, let’s say it’s the attention to detail. Some phở recipes require a step where you must char the onion and ginger before using it in the broth. The charring really brings out the flavor. Also, when making the broth out of beef bones, it’s important to parboil the bones, and then skim any foam out of the liquid to get rid of those impurities. In design, for example, little things like kerning, proper use of ligatures and other specialized glyphs, or color-correcting photos are tasks that may be taken for granted by non-designers, but they all help make the design shine. When designing without a process in place, or rushing through it, you’re really doing the design a disservice. You might not have explored or iterated enough. You might miss details (and the devil is in the details! ), the design may not have had have enough time to develop its full flavor. A little shortcut here or a little neglect there manifests in the final product. The reality is that every project has its scope and limitations, whether there is a time constraint, tight budget, existing problems to deal with, or lack of quality visual assets and content. In each case, clients need to identify which aspects of the project are a priority and which are not. Items may need to be replaced with cheaper, easier, or time-saving substitutions, or omitted completely, and the client needs to understand and be okay with the outcomes of those decisions. In terms of phở, a big shortcut one could take is to substitute pre-made beef broth instead of boiling beef bones for hours. A pho broth may not be the most authentic if you choose to do that, but hey, if you are pressed for time, don’t have beef bones on hand, and you’re okay with getting “pretty close” to the real thing, then that solution is realistic and appropriate in terms of your goals. Now, who’s down for some phở?